AUSTRALIA has not grappled with a problem that is going to leave a huge hole in our finances, and we're not going to like the solution. The problem has already begun with more fuel-efficient cars, but it will become a crisis when electric cars take over. These environmental angels are budgetary devils, everyone agrees. 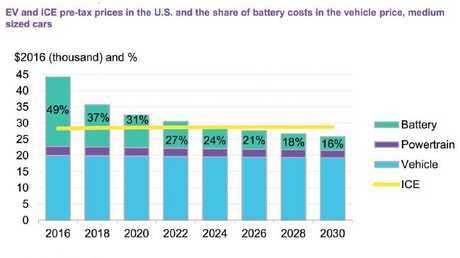 When we start zipping round in battery-powered cars, we save those 40.9 cents. Yippee! But that money will no longer be going to the Treasury. The lost revenue is nothing to cheer about. We're talking about $5 billion a year in lost revenue that Aussies will have to come up with somehow. To be very clear, this is not a massive problem yet. For now, Australians don't care much at all about electric vehicles. Normally a nation of early adopters, we've given electric vehicles a miss. Even tiny New Zealand has more of them than we do. 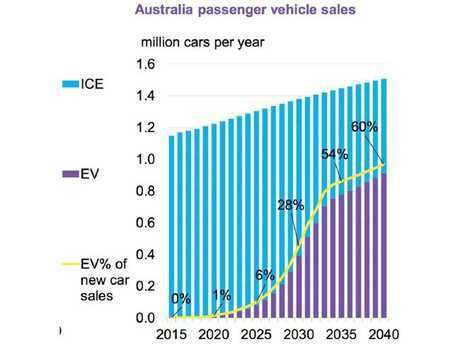 It would be a mistake to interpret our sluggish start as a sign Australian will never adopt electric cars. 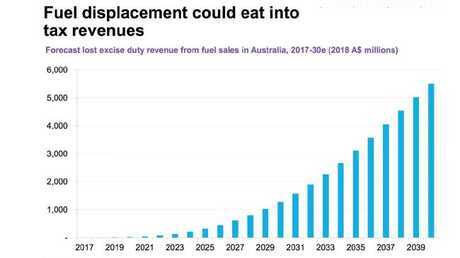 The NRMA is building a big network of chargers, and most forecasts - like this next one from Bloomberg New Energy Finance - show Australia will be swimming in electric vehicles before long. The big reason we have little enthusiasm for electric cars so far is how few models are on sale, say experts from Energeia. There are just four models a person can buy. Two are Teslas - the Model S and Model X, which can easily cost over $150,000. Then there is the BMW i3, at $70,000-plus for a small car. And finally there is the more affordable but weeny Renault Zoe. All that will change very soon. 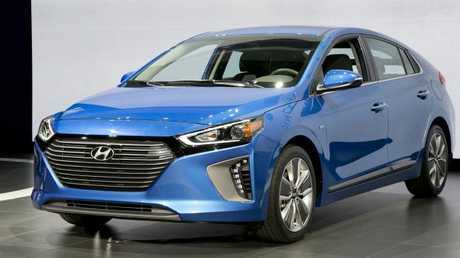 Hyundai is supposedly going to bring the Ioniq and the Kona to Australia this year, and Nissan is expected to launch the Leaf. All of those are sensible electric cars with decent range at non-crazy prices. 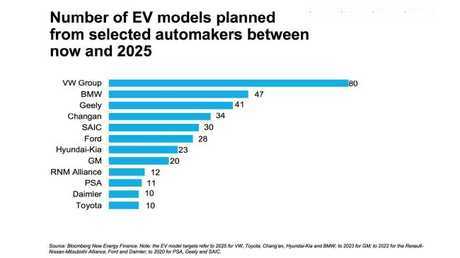 And that will just be the start of the electric car avalanche, as the next graph shows. What's more, the price difference is expected to get compelling soon. High battery prices mean electric cars are more expensive now, but they are falling fast. What this means is our Budget problem could hit a tipping point. The hole in our finances could go from puny to powerful before we know it. SO HOW DO WE PLUG THE GAP? There's a good solution. But there's also a really easy scare campaign against it. The solution the experts agree on is this: a kilometre tax. They call it "distance-based charging." Basically, this is a way to be fair. The more you use the road, the more you pay. 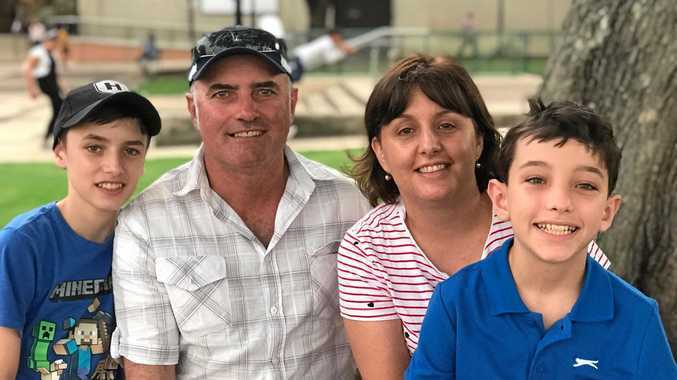 "Distance based charging is more equitable," NRMA chairman Tim Trumper told a senate committee recently. "We don't have a firm view on how that is executed but we think, over time, distance based charging will be needed." Basically you have some sort of GPS or odometer in your car and you get a bill based on how far you go. I like this solution personally. It makes sense to me. But the risk is that the scare campaign makes it impossible. Getting mad about distance-based charging could become a very easy stance for a politician with a penchant for wreaking havoc on progress. They might call it a "kilometre tax," like I did, or a "tax on getting to work," or "a tax on not living in the fashionable inner city where you can ride your bike to work in a coffee shop making soy lattes for fashion designers." And, okay, maybe distance-based charging is a bit unfair. If you live far from town and have a long commute, you get slugged. But petrol tax works the same way. 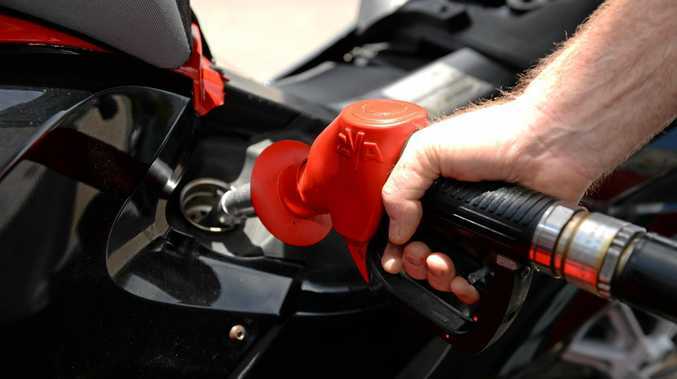 What's more, people who are least able to afford the petrol excise have older cars that are generally least fuel efficient. The roads get damaged by cars travelling on them, and if we give up all taxes on driving, we lose a major revenue source that helps fill the potholes. Giving up on fuel excise and on distance-based charging could also make traffic worse. If we don't accept this new kilometre tax, we could be making the country worse. And that is not supposed to be the point of electric cars at all.